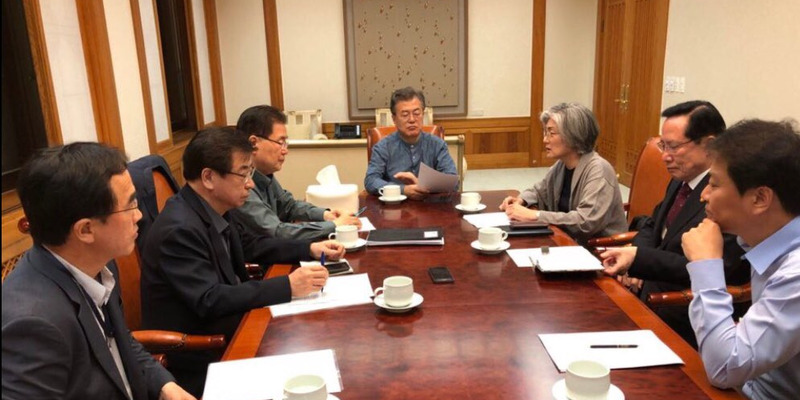 A photo released by South Korea's Blue House hints at the mood in the room as South Korean President Moon Jae-in and his cabinet met for an emergency midnight session to discuss news that President Donald Trump abruptly canceled his upcoming summit with North Korean leader Kim Jong Un. The move was likely a major blow to Moon, who has been working to reestablish ties between the two Koreas. He held a summit with Kim less than a month ago and the two agreed to work towards officially ending the Korean war. Moon had visited Trump just one day prior to prepare him for upcoming talks, and South Korean officials stated the meeting had high chances of going through as planned. The White House may not have notified South Korea of its decision, and will likely affect relations between South Korea and North Korea moving forward.